OMNI-A0092 is a wideband wire-cone, monopole antenna for 1 to 30 MHz. It has superior radiation pattern for HF signal interception and communications. OMNI-A0092 is deployable from its compact enclosure, using the winch mechanism and pneumatic actuation in fewer than 3 minutes. 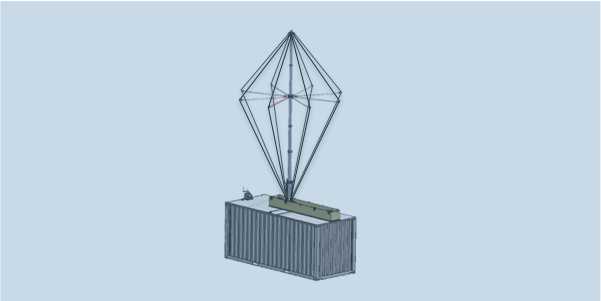 The antenna is deployed and broken down easily and quickly in the field by two persons. OMNI-A0092 is equipped with a sophisticated frequency selective matching unit, providing excellent VSWR of less than 2.6:1 and a typical value close to 1.7:1. Band switching and other matching control requirements not necessary. Designed for deployment in the worst soil environments such as deserts, wetlands, and urban areas. A groundplane structure of 20 feet or larger is suggested for optimal use.